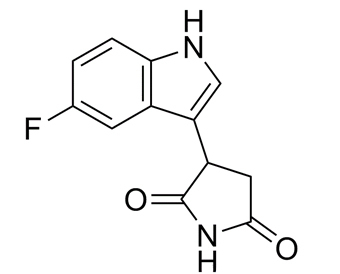 PF-06840003, also known as EOS200271, is potent IDO-1 inhibitor (IC50 0.15 μM). PF-0684000 has moderate hIDO1 enzyme inhibition (IC50 0.41 μM). It is a highly efficient compound (LE 0.53, LipE 5.1), driven by its tight packing within the enzyme, as well as the high density of hydrogen bonds it forms with hIDO-1 despite its small size. PF-0684000 shows good potency in an IDO-1 human whole blood assay and also shows a very favorable ADME profile leading to favorable predicted human pharmacokinetic properties, including a predicted half-life of 16−19 h.
. Tumang J, et al. PF-06840003: a highly selective IDO-1 inhibitor that shows good in vivo efficacy in combination with immune checkpoint inhibitors. [abstract]. In: Proceedings of the 107th Annual Meeting of the American Association for Cancer Research; 2016 Apr 16-20; New Orleans, LA. Philadelphia (PA): AACR; Cancer Res 2016;76(14 Suppl):Abstract nr4863.